This is an archived page that may contain outdated or incorrect information. Please visit www.Greenville.com for the latest news, events, and more. 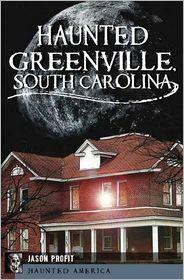 Greenville author Jason Profit will be signing copies of his new book of ghost tales, Haunted Greenville, South Carolina (The History Press, paperback, $19.99) at Fiction Addiction on Saturday, October 22nd, from 1-3pm. Haunted Greenville aims to bring readers up close and personal encounters with some of Greenville's most little known haunted locations. Our journey begins with the Greenville Army Store, one of the oldest businesses downtown that is still run by the same family that opened it around 1946, and still haunted by the founder, Mr. Zaglin. Around the corner from the Army Store is the former location of the Chicora Women's College, which is one of the most actively haunted locations downtown, where lost souls are often spotted wandering. Jason Profit is a local private paranormal researcher and psychic reader who has clients all over the world who seek his insights and guidance. Jason's interest in the spirit world began early in life. He was born to a God fearing Christian woman who also happened to cleanse homes of ghosts and demons in the name of God. His mother and another well respected Christian community leader here in Greenville used to be known as the ones to call when the ghosts had moved in. Even today, she still helps when the spirits lead people to ask her, "Can you help me get rid of these?" Jason spent his early years of life side by side with the spirits his mother was sending on their way... As a child he grew up in some of the most haunted homes here in South Carolina and beyond. Kind of a by product of being related to an old school "ghost buster." His knowledge of hauntings and the spiritual world has led him to a life long passion for private paranormal research. Those who cannot make the signing can reserve a personalized copy of Haunted Greenville, South Carolina by contacting Fiction Addiction in advance at 864-675-0540. ABOUT FICTION ADDICTION - Fiction Addiction is a local, woman-owned, independent bookstore established in 2001. The store carries a mixture of new and used fiction and nonfiction, including children's books, as well as gift items. For more information, call 864-675-0540. Looking for more happenings in the area? Check out Greenville.com's comprehensive visitor center.